You can view the DCED-BEAM Seminar 2018 Seminar here. You can view the 2012 DCED Global Seminar page here and the 2014 Seminar page here. 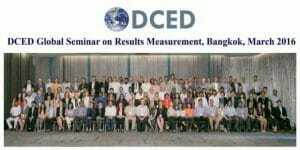 The DCED Standard for Results Measurement has gained wide acceptance as a framework for monitoring effectiveness in real time; it is now in use by an estimated 150 programmes around the world. Every two years, the DCED hosts a Global Seminar to deepen understanding on selected topics of particular interest to the community. The 2016 DCED Global Seminar featured presentations and discussions on cutting-edge themes such as measuring women’s economic empowerment, assessing attribution, measuring job creation, and using results information to manage programmes. Sessions included plenaries and break-outs, with time for discussion between the 130 participants. The full agenda, presentations and relevant links are included below. A final summary report is also available. 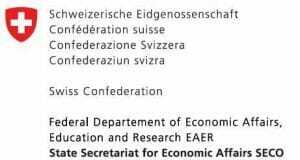 If you would like to access resources from previous Global Seminars on Results Measurement, please contact the DCED Secretariat. Both presentations are available here. Using Information on Results in Program Management – The case of Samarth-NMDP in Nepal, 2015. Building a Learning Culture – The Case of the Market Development Facility in Fiji, 2015. Adam Smith International (2016): Measuring Gendered Impact in Private Sector Development. Technical Reflections and Guidance for Programmes. Market Development Facility (2015): How Women contribute to and benefit from growth. Integrating Women’s Economic Empowerment into the MDF Approach. Defining attribution methodologies and applying them in practice. Four case studies on assessing attribution, Zakaria Tavberidze, Sanju Joshi, Syeda Samira Saif, Belinda Boateng. DCED (2015): Measuring Attribution: a practical framework to select appropriate attribution methods, Hans Posthumus Consulting. Case study of the intervention of MDF with Acelda in Timor Leste, illustrating the use of a before and after with opinion method. Case study of Samarth-NMDP intervention in the ginger sector in Nepal, illustrating the use of a quasi-experimental method. Case Study of Propcom Mai-Karfi (PM) intervention in the tractor market in Nigeria, illustrating the use of comparison groups. Case Study of the Alliances Lesser Caucasus Programme (ALCP) in Georgia, illustrating how a single impact assessment could assess attribution for multiple interventions. Practical Guidelines for Implementing the DCED Standard: Measuring Attributable Change. The Participant Marketplace offers participants the opportunity to present their work. Katalyst Bangladesh, Fortunat Diener; Katalyst’s new framework for assessing systemic change can be downloaded here. Springfield (2014): Adopt-Adapt-Expand-Respond: a framework for managing and measuring systemic change processes. USAID (2014): Evaluating Systems and Systemic Change for Inclusive Market Development. Practical Guidelines for Implementing the DCED Standard: Assessing Systemic Change. All presentations can be viewed here. ILO (2015) The BOSS Project in Timor-Leste: Thin Markets, Thick Impact?, ILO, 2015. DCED (2015): Monitoring Program Progress: The Case of Making Markets Work for the Jamuna, Padma and Teesta Chars in Bangladesh, Hans Posthumus Consulting.